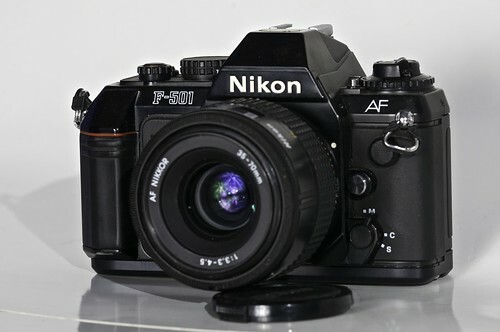 The Nikon N2020 (better known as Nikon F501) was the automatic focusing version of the Nikon F301 (N2000). 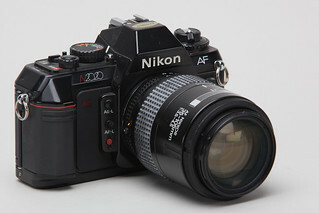 It was Nikon's first popular autofocus SLR for 35mm film, launched in 1986. It uses a electronically controlled vertical travel focal plane shutter with stepless speeds from 1s to 1/2000 with a battery powered B mode. Flash sync is at a maximum of 1/125 a sec. The self-timer is electronic and features audible and visual cues with a delay of 10 seconds. 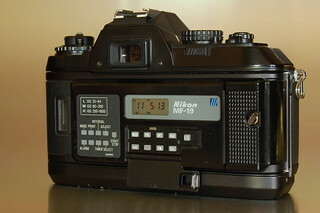 The meter has a range of 1 to 19 EV at (ASA 100, f/1.4), settable to film speeds from 25 to 5000 ISO for DX coded film but can also be manually set from 12 to 3200 ISO. The film transport is motorized. It supports automatic first frame film loading, and can be advanced in S (Single) or C (Continuous shooting) modes. It uses four AAA batteries with the MB-4 holder or with the MB-3 holder four AA. This page was last edited on 22 February 2016, at 11:29.